A firefighting pilot was rescued after his small air tanker crashed in northern Nevada while he battled one of the dozens of wildfires tormenting the West, officials said Wednesday. Jamie Thompson, spokesman for the U.S. Bureau of Land Management, said the AT-802A single-engine tanker was fighting a blaze south of Winnemucca when it went down Tuesday evening. The rescued pilot was pulled from the wreckage by firefighters, treated at a hospital and later released, she said Wednesday. "Other than being pretty well soaked with slurry and aviation fuel, he was OK," Thompson said. "They cleaned him up and sent him home." Officials said the plane was under contract from Minuteman Aerial Applications out of Montana. An investigation team was expected to determine the cause of the crash, Thompson said. 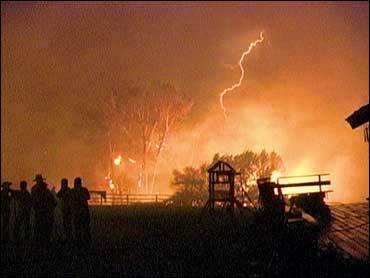 Across the West, the extreme dry weather and wind have spread wildfires and made fighting them difficult. The National Interagency Fire Center reported 68 large fires burning Wednesday in 12 states, led by Nevada, Oregon and Idaho. In Nevada, the Hawken Fire near Reno is threatening to 400 residences and 60 commercial properties, reports CBS News affiliate KTVN. Gusty winds are causing violent and erratic fire behavior with fire brands flying up to one mile ahead of the main fire front. In Southern California, residents in Santa Barbara County were able to return to their homes late Tuesday after crews set backfires to keep at bay a large wilderness fire that had burned nearly 44 square miles. Officials cautioned that the weather was still volatile and the terrain in the mountains of the Santa Ynez Valley was tough to work in. "It could jump the ridgeline, but we're working to keep it back and we're monitoring Santa Ana winds," said Rick Todd, a battalion chief with the Santa Barbara County Fire Department. In Northern California, overnight drizzle helped firefighters battling flames that threatened more than 300 homes in and around Happy Camp near the Oregon border. The fire was about 15 percent surrounded. Washington Gov. Chris Gregoire declared a wildfire emergency in her state, freeing state agencies to spend money to help local firefighting efforts. The National Guard and Washington State Guard could also be mobilized if necessary. One lightning-sparked blaze in north-central Washington near the Canadian border was threatening 145 homes but only a few had been ordered evacuated.